Most users save at least $200 on their tax returns by deducting their sales tax! The IRS allows individuals to deduct their state income tax or their sales tax in any given year. However, the IRS hopes most people aren't going to keep all of their receipts so they provide standard sales tax deductions based on how much income you make. 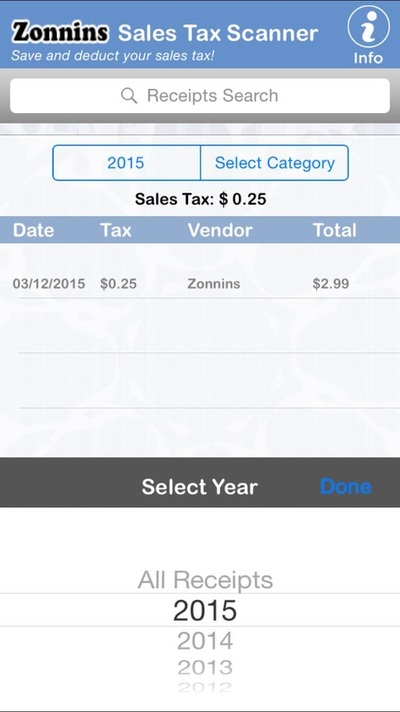 To see what your allowed sales tax deduction is click here. As you can imagine, this is a conservative estimate. 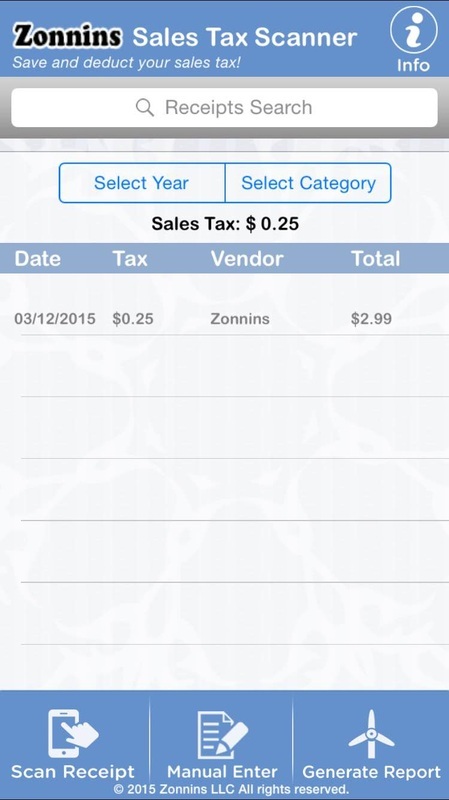 Because the IRS allows the use of images instead of the physical receipts, we've created the Zonnins Sales Tax App ©. Using this app, skip the hassle of saving all of your receipts and adding them up at year end. 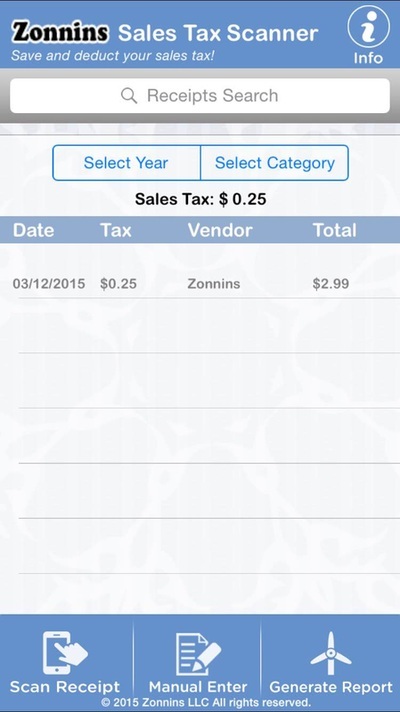 Your camera is much more efficient than scanning receipts one by one into a desk scanners. Can I throw away the receipts? Yup! Page 9 of this document confirms the admissibility of using electronically saved receipts. The IRS doesn't allow taxpayers to use their credit card reports as evidence of receipts so that's why its important to save pictures. Now take a picture of those receipts and start saving! Unlike many free apps which collect your information and sell it, we don't collect any of your information. In fact, you can use our app in airplane mode as it doesn't connect to the internet. We believe our users are willing to pay the price of the app to keep their purchases private. Who should I email about questions? 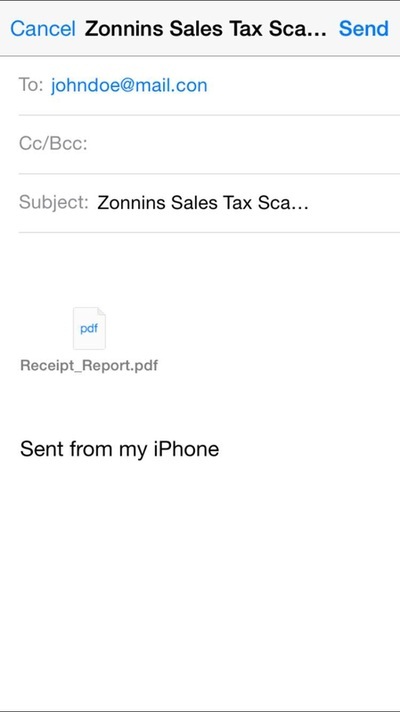 Please email support@zonnins.com with questions or to provide any feedback. DISCLAIMER: The information contained here is provided for informational purposes only and is not intended to substitute for obtaining accounting, tax, or financial advice from a professional tax planner or financial planner. Presentation of the information via the internet is not intended to create, and receipt does not constitute, a tax planner-client or financial-planner-client relationship. Internet subscribers, users and online readers are advised not to act upon this information without seeking the service of a professional tax and/or financial planner.